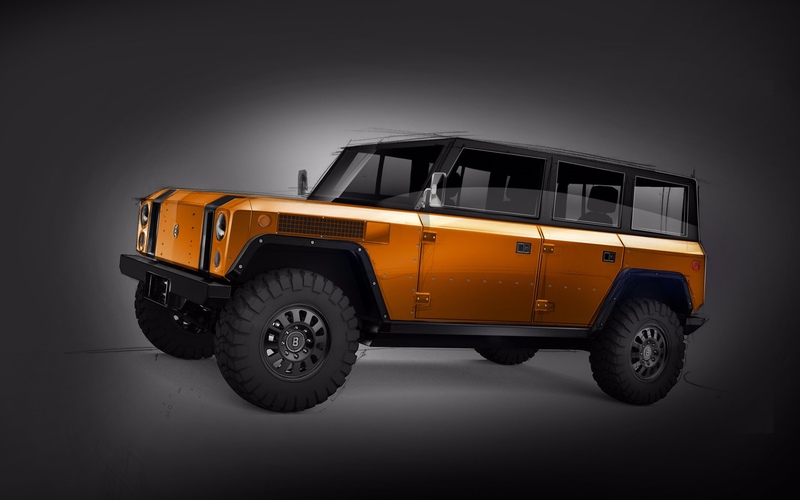 Thank you for reserving your Bollinger B1 All-Electric, All-Wheel-Drive Sport Utility Truck. We are excited by the overwhelming response we've received about the truck and are working diligently to bring it to production. Sometime in 2018 you will have the opportunity to pre-order your B1 with a down payment, with the option of either 2-Door or 4-Door and either 60 kWh or 100 kWh battery pack. Other options will be listed then. And the ability to convert between full-cab and half-cab is a standard feature of every B1 – no need to choose. A retail price will be announced later in the year. Our goal is to get the truck rolling off the assembly line in early 2019. There's still so much to do, but we are on it! The B1 will be manufactured with certification and compliance for road use in the United States and Canada. Following that, we will be looking at export to other countries in both left hand drive and right hand drive versions. As a start-up automotive company we have a lot of hard work ahead. Thank you so much for all of the great comments and encouragement you've sent us. Copyright 2017 Bollinger Motors, LLC., All rights reserved. Dumt spørsmål, men, er dette en bil man kan kjøre på motorvei med? Den virker jo veldig rettet inn mot offroad markedet? Er jo ikke spesielt velegnet for det, men har nok ingen problemer med det heller. Thank you so much for reserving a B1! A lot has been going on since our reveal in July. First we did a lot of testing on my farm in the Catskills and dyno testing to validate our work and get a ton of data. Then it was off to the Longhorn River Ranch in Austin, Texas for the Texas Truck Rodeo, where the B1 was the only all-electric truck in attendance. TAWA member and iHeart Radio show personality Harold Gunn taped a podcast segment with me from the show as well. From there we headed to the Rocky Mountains in Colorado, the Sand Flats in Utah and most importantly in Moab! Then we headed to Las Vegas for the SEMA Show. During the SEMA Show, we met with industry professionals and a number of suppliers to talk about accessories and parts for the B1 production vehicle. We're moving forward on all aspects of production and will have a retail price very soon to announce. Our next stop will be at the Los Angeles Auto Show which runs from December 1st through December 10th. If you’re around please stop by our booth in the West Hall and see the B1 in person. Hope to see you there. Thank you all for your continued encouragement and support. Noen som vil spekulere i pris på herligheten? Bollinger har sagt det selv, og det ligger i kortene. Det vet jeg ikke, men antar godt over 800k, tror den blir dyrere enn X desverre. Siden ble generert på 0.084 sekunder med 33 spørringer.